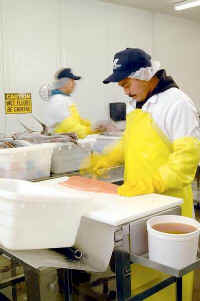 Seafood Supply Company specializes in producing fresh seafood custom cut to your specifications. Our greatest strength is producing the fresh product you need and how you want it processed. We have a large variety of all products and will be glad to carry products of your choice. From Albacore to Yellow-eyed Snapper, we carry a complete line of fresh seafood. Please call us for more details. "All of our fresh tuna is lab tested for histamine levels so that you may feel secure about your purchase. Lab tested, on site, every day". Fresh seafood, at a fair price, when you want it.